The What: Five years after they first came to market, Elements series speakers by Peavey Electronics are now even more weather-resistant in the most demanding climates. 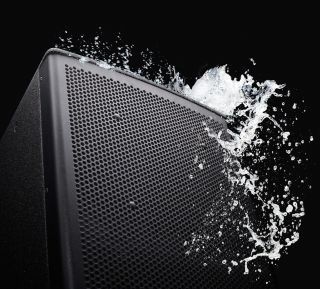 The IP-56 rated Elements C series of composite speakers are now protected from dust in addition to being waterproof, ensuring sonic performance and longevity. Peavey's Elements C-Series Speakers feature an IP-56 rating. The What Else: The Elements C series enclosures are constructed from a composite material that is dimensionally stable in wet conditions and resists contamination, yet has the resonant properties of wood. The Black Hammerhead polyurea finish is similar to a high grade of truck-bed liner, further sealing the waterproof composite cabinet panels from the environment. On the front, a stainless steel moisture-repellent grille has reticulated foam and a layer of hydrophobic water-repellent cloth for triple-layer performance that doesn’t affect the speaker’s sonic quality. On the back, gland nut entry into the water-sealed input cup plate ensures no water will leak where the speaker cable comes in. The Bottom Line: The weather-resistant Elements C series speakers are available in three two-way, full-range configurations and as a flyable subwoofer; the new Elements C series loudspeakers will be available from authorized Peavey retailers.